AB: Probably lack of discipline and follow-thru mixed with a good bit of luck. Well I hate to say it but watching Donald Trump try to destroy his own campaign is pretty interesting. It would be hilarious if he didn’t have even a small a chance of getting the nuke codes. Probably by trying to “neg” me – that is, saying something critical simply for the sake of getting me to respond. 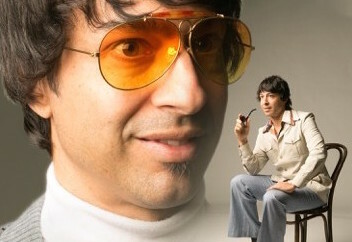 What advice would you give a 15-year-old Arj Barker? Don’t be afraid of rejection. What other people think about you doesn’t matter as long as you respect yourself. Try to be a good person, but know that you can’t please everybody no matter what you do. Don’t sleep on your stomach. Practice guitar more often!! I’m a bad listener, sometimes, a lot. I always forget to use gift cards, so the money might go back to person who gave it to me after so many years. That is sort of re-gifting, ain’t it? What can your fans expect from Get In My Head? You will laugh a lot. Especially if you go into the show expecting to enjoy yourself. Arj Barker is bringing Get In My Head to Australia this week – find out where he will be near you!